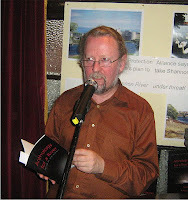 I went to Limerick last Thursday to read my poem which is included in the Anthology for a River collection. This is a fund raising and awareness raising venture as part of a campaign to call a halt to the water extraction proposals Dublin City Council is pushing as a solution to chronic water shortages in the capital. The campaign is organised by the River Shannon Protection Alliance. More details here and here. Edited by well known Limerick writer, Teri Murray, the anthology includes the work of 38 poets who have either written tributes to the Shannon or jeremiads against Dublin City Council’s plans. Mine was neither really, a short poem written in Dromineer on Lough Derg at a poetry workshop by Dublin poet Tony Curtis. It's called Diving into Lough Derg. A great night in the White House pub, lots of fun and enthusiasm, chat and poetry. Jane Clarke from Dublin, originally Roscommon, also drove down to read one poem so I felt less of a fool. I also met poets Richard Halperin and Tim Cunningham there. Anyway Limerick is a great place to visit. I went down early, looked around St Mary's Cathedral and browsed the second-hand bookshops. 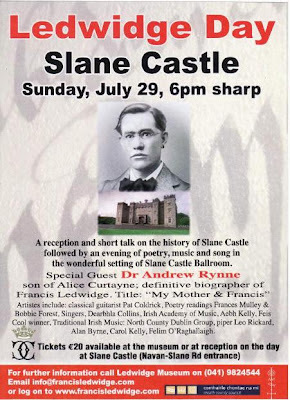 Enjoy an evening of poetry, music and song at the annual celebration of the life and writings of poet Francis Ledwidge which takes place on Sunday 29 July in Slane Castle. The event begins with a Cheese & Wine Reception in the splendid Entrance Hall at 6pm. A short talk on the history of Slane Castle will follow and the main event will then take place in the Gothic Revival Ballroom. Frances Mulley, international poetry reader from Belfast will read and Bobbie Forrest from Limavaddy, Co. Derry, will sing and recite some Ledwidge poems. Dearbhla Collins from Drogheda, a second year student with Dr. John O’Connor in the Royal Irish Academy of music and Aebh Kelly from Skerries, a recent Feis Ceol winner will perform music and song. Pat Coldrick from Navan will play classical guitar and traditional Irish music will be provided by a very talented group of musicians from North County Dublin with uileann piper Leo Rickard. Tickets, 20 euro, are available at the museum or pay at reception on the day. 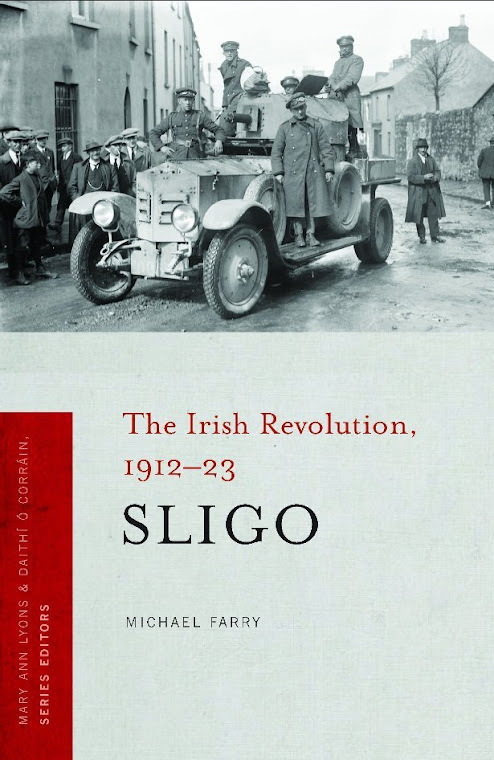 For further information; contact Francis Ledwidge Museum or email: info@francisledwidge.com. Website here. Help launch a poetry book to raise funds to protect the Shannon! The background is the proposal to drain upwards of 500m litres of water per day from the headwaters of the Shannon to supply Dublin's needs. River Shannon Protection Alliance has organized a book of poetry to fund efforts to save the Shannon. The anthology is called Anthology for a River and it is edited by the well-known Limerick poet, editor, novelist and playwright, Teri Murray. I have a poem in the anthology called Diving into Lough Derg which was begun at a workshop with Tony Curtis at Dromineer Festival a couple of years ago. Dromineer is on Lough Derg, part of the Shannon system. Picture above is from their website. 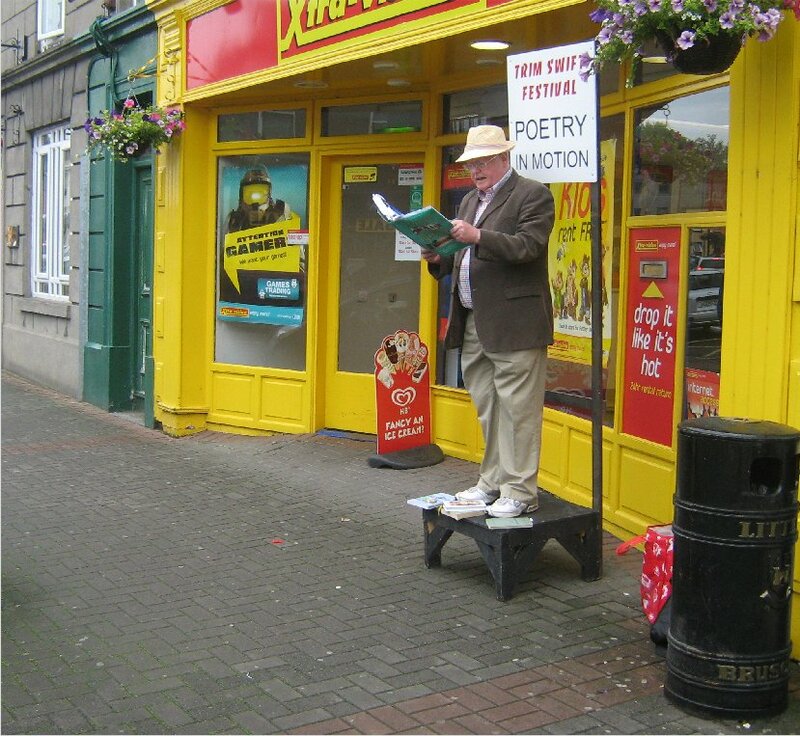 The anthology is being launched on Thursday, 26 July, at 8pm in the White House pub on O'Connell Street, Limerick. Meet and hear many of the 38 contributing poets. Free refreshments. Refreshments served. More, including a poem from the anthology, here. This looks like a very interesting reading in central Dublin. Ideal after a day in the National Library close by. The Gallery Press in association with Hodges Figgis presents an evening of poetry with Eamon Grennan, Vona Groarke and introducing Andrew Jamison, Michelle O’Sullivan, MC: Peter Fallon. I'm delighted to see Michelle O'Sullivan (above) has published her first poetry collection with Gallery, The Blue End of Stars. Michelle was one of the poets included in Boyne Berries 1, 2007, and she made the journey from the north west to read at the launch. I'll be checking to see if the poem we printed, The Wishing Box, is included in this collection. Labels: The Gallery Press; Hodges Figgis; Eamon Grennan; Vona Groarke; Andrew Jamison; Michelle O’Sullivan; Peter Fallon. The Penny Dreadful is a new Cork based literary magazine and is currently accepting submissions. We accept all known forms of creative writing, and several that are sadly as of yet unknown to all but our editorial staff. And we want you. Yes, even you, as wretched and forlorn as you may well be. We want you to submit to us anything that you may happen to have written that you feel is of a certain quality and standard to appear in the esteemed pages of The Penny Dreadful. So then go forth and multiply and then tell us about it in a poem or something. Fiction: Two stories of no more than 3,000 words. Poetry: Six poems, unless you are writing long heroic epics. We won’t accept six of those. Post: The Penny Dreadful, 7 Sharman Crawford Street, Cork. I had two poems published in this great annual publication in 2009 when the editor was Ciaran O'Driscoll. 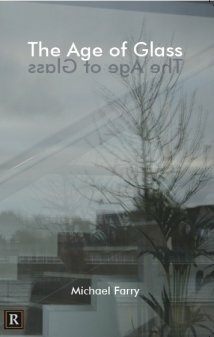 The Stony Thursday Book is seeking submissions from local, national and international poets for its next issue, to be published as part of CUISLE, Limerick City International Poetry Festival in October 2012. 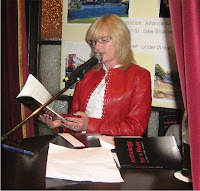 This years editor is the Limerick based poet Jo Slade. 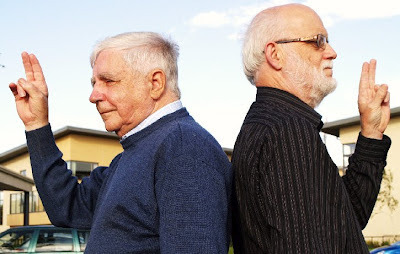 The Stony Thursday Book was founded by Limerick poets John Liddyand Jim Burke in 1975, and has also been edited by Mark Whelan, Kevin Byrne, Patrick Bourke and Knute Skinner, Thomas McCarthy and Mary Coll. The Stony Thursday Book is one of the longest-running literary journals in Ireland and celebrates its 37th Anniversary Edition in 2012. To Submit: Send no more than 6 poems, write your name and address on each page. Closing date for submissions: Friday August 10th 2012. CUISLE, Limerick City International Poetry Festival will take place in Limerick from 10th – 13th October 2012 and is funded by The Arts Council & Limerick City Council. 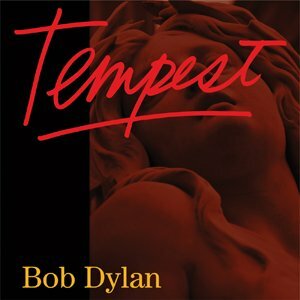 Columbia Records announced today that Bob Dylan’s new studio album, Tempest, will be released on September 11, 2012. Featuring ten new and original Bob Dylan songs, the release of Tempest coincides with the 50th Anniversary of the artist’s eponymous debut album, which was released by Columbia in 1962. The new album, produced by Jack Frost, [Dylan himself] is the 35th studio set from Bob Dylan, and follows 2009’s worldwide best-seller, Together Through Life. Full press release here. Lots of comments on the web. Suggestions that the cover may be based on Bernini's sculture, The Ecstasy of St. Teresa though this statue of Pallas Athene in Vienna seems to be a contender also. The full set list is here and it is said to contain two epic songs, one about the Titanic and one about John Lennon. Dylan is finishing a European tour at the moment and goes on to tour in the USA later in the year. No Irish date in the current tour. After Friday's brilliant Paul Simon concert in Dublin I played Dylan on the way to Tralee to reassure myself. Blood on the Tracks did the job. 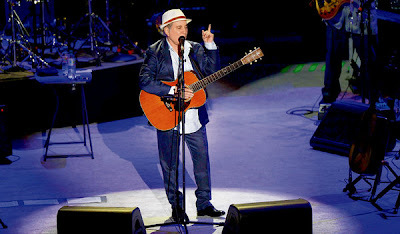 Due to a lucky (unlucky for some) chance I got two tickets for Paul Simon's Friday night concert in Dublin. And not just any tickets, second row, right in the middle. It was a great concert. I've never seen Paul Simon live before. Almost two and a half hours of music, with the full Graceland album performed with many of the original artists. Ladysmith Black Mombaza also did a short set of their own. All stages of the singer's career were covered with versions of The Boxer and Sound of Silence and a great finish on Still Crazy. Earlier he sang Dazzling Blue from the most recent So Beautiful or So What album. But the highlights had to be the Graceland songs. Among these The Boy in the Bubble was my favourite, Simon's Desolation Row, delivered in front of three screens of dramatic images which added to the effect. Irish fiddler, Martin Hayes, played with Simon on a couple of songs and South African singer, Thandiswa Mazna, joined Simon for Under African Skies as well as singing a couple of her own songs. Simon, and indeed all the musicians, seemed to enjoy themselves immensely and responded well to the crowd appreciation. The full setlist is here. Eileen Battersby in the Irish Times caught the flavour and reaction to the concert perfectly but this this other one seems quite a bit off. Well actually completely off. It was Paul Simon you went to see Phil. So Paul was very quiet? Do you mean he didn't talk much to the audience? Have you been to a Dylan concert recently? Picture is from the Irish Times review. 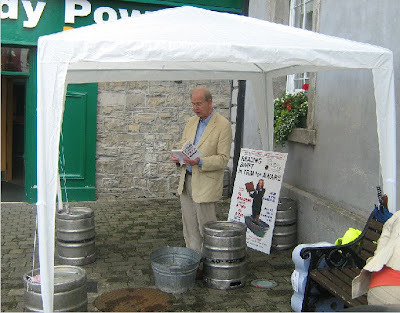 A very enjoyable visit to Tralee for the Poets in the Doghouse reading in Siamsa Tíre. Six of this years poets took part, Monica Corish, Barbara Smith, Gréagóir O'Dúill, Anatoly Kudryavitsky, James Lawless and myself. A small but very appreciative audience in a great venue. We each read from our current Doghouse book for about 15 minutes. I was nominated to go first so I read twelve poems with short introductions. I tried to pick ones I hadn't read in public recently and left out "greatest hits" so no Ball of Twine or spreading all my clothes from here to Sligo. (Buy the book!!) As you read a poem you learn something new about it. A great variety of poetry on offer. It was fascinating to listen to the others and make mental notes - Must try that! Why didn't I think of that? Anatoly hasn't yet had his book published. It's an anthology of Irish Haiku entitled Bamboo Dreams, and the launch is set for 25 September in the Unitarian Church, Stephen's Green, Dublin. It should be quite an occasion. 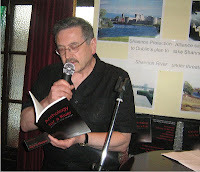 Anatoly explained that Ireland was the last country in Europe to have a national anthology of haiku. Well done Doghouse! Then a meal with the other readers, Editor Noel and Doghouse poets and friends. Great discussion on poets and poetry. I came home with a list of poets I must look up and read. Thanks Doghouse! Pictures: Top: Barbara Smith. 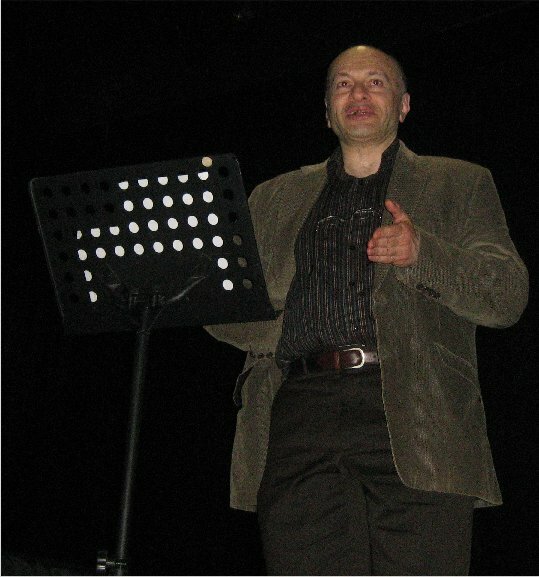 Right: Anatoly Kudryavitsky. I'm really looking forward to this, a reading with the other Doghouse 2012 poets in Siamsa Tíre Theatre, Tralee this Saturday evening. The details: Doghouse Poets. Saturday 14 July at 5pm. Poetry Ireland in association with Siamsa Tíre Theatre and Doghouse Books presents Monica Corish, Gréagóir O'Dúill, Michael Farry, Anatoly Kudryavitsky, James Lawless and Barbara Smith. PAUL SIMON plays the O2 in Dublin, this Thursday & Friday, 12 & 13 July, and I have been lucky enough to get a ticket for the Friday show. Dylan skipped Ireland in his current European tour so this is the next best thing. Thanks!!! ‘Under African Skies’ – a documentary directed by Joe Berlinger chronicling the creation and lasting influence of ‘Graceland’ debuted at the Sundance Film Festival in January of this year, kicking off a year-long celebration commemorating the 25th Anniversary of Paul Simon’s musical and cultural achievement. In 1986, ‘Graceland’ sold 14 million copies worldwide, and received universal praise from critics around the globe. In 1987, it won Album of the Year at the Grammy Awards. Then, in an unprecedented carryover, the album garnered the Grammy for Song of the Year with its title track in 1988. 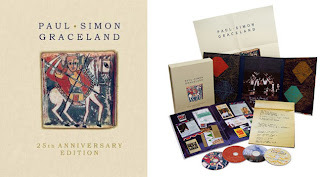 Graceland continues to provide rewards to its listeners and remains a pivotal listening experience for writers, artists and fans alike. All in all it promises to be an incredible evening, from one of the greatest contemporary songwriters of our time." 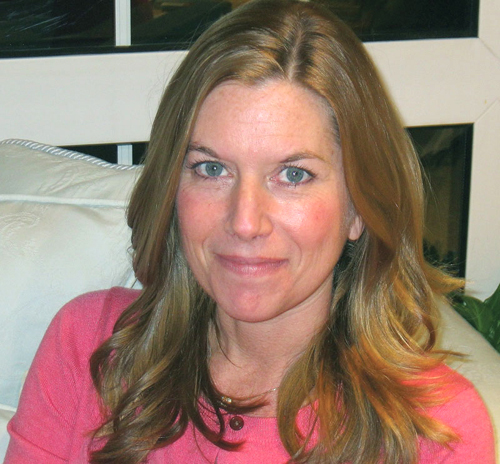 Kerrie O Brien – Matters of the Heart. As part of the 10 Days in Dublin, 5 - 14 July Festival: Kerrie O Brien poetry reading entitled Matters of the Heart on 13 July at 19.30 in the Twisted Pepper, Middle Abbey St., Dublin. Running Time 60 mins. Free!!! Come and experience one of Dublin’s emerging literary talents. Her poems explore memory, faith, loss and the fragility of human relationships. Kerrie O’ Brien has been published in various Irish and UK literary journals. In February 2012 she was the first poet to read as part of the New Writers Series in Shakespeare & Co. Paris. 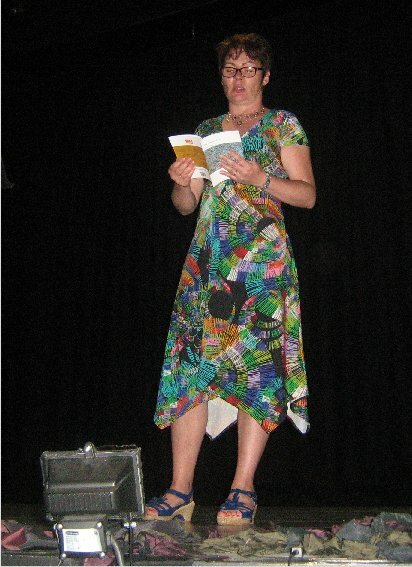 Her poem Blossoms was chosen as the winning entry in the Emerging Talent category of the 2011 iYeats Poetry Competition. She recently won the RTE Arena Flash Fiction Competition 2012 and Culture Ireland have sponsored her to read in Los Angeles in June. She was highly commended for the Over the Edge New Writer of The Year Competition 2011 and has performed her work at festivals such as Electric Picnic. This is the victorious Meath Writers Circle team having been presented with the Battle of the Books trophy yesterday. 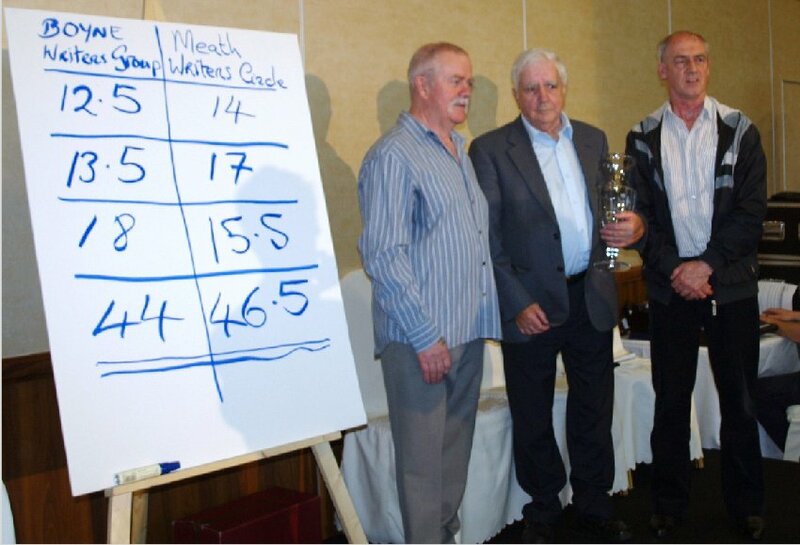 Michael, Tommy and Frank look happy at having defeated us. Well done! The scoreboard shows that we lost by 2.5 marks. I might just point out that the 18 - the highest individual score of the contest - was mine, one judge gave me a maximum 10. And here is a scene from my Gulliver's Travels, the modern 5 minute version. Kevin, Mary and Eoin did a great job. It's a thrill to see such fine actors taking your words off the page and making them come alive. Thanks!! The Swift Satire Festival concluded with a feast of satire this afternoon at the Bite of Satire Lunch in the Trim Castle Hotel. 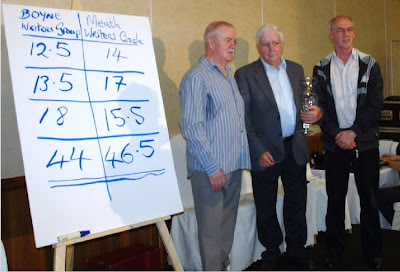 In the annual Battle of the Books satire competition The Meath Writers Circle had a narrow but deserved win over us, Boyne Writers. They took the lead straight away and never really looked like being overhauled. Michael "Sheriff" Shiels, Frank Murphy and captain Tommy Murray had strong topical pieces full of humour and satire. Their blogs will no doubt be full of reports and maybe pictures. Our team performed very well. Barbara Flood was called in at the last minute to read for Caroline Carey Finn who suffered a family bereavement and did very well. James Linnane and myself did our best but it wasn't to be our year. Well done Tommy, Frank and Michael. Looking forward to next year already! Then there was the five minute play competition with the shortlisted five being performed. This worked very well, the plays were very different but were all enjoyed by the large audience. The two plays from Bradford were ambitious, very funny and very well staged. Inspector Gulliver Calls, by Vera Cait Walsh, Wicklow Town was set in a not very attractive future and the costumes were especially effective. My Gulliver's Travels, the modern 5 minute version was very well done by my three actors and went down well. The judge had some nice things to say about it. But the obvious winner was the other Trim play Gulliver at the Gate, by Gareth Mahony. Sharply satiric, great characters and costumes (the stars and stripes tie was a winner on its own) it was both the judges choice and the popular winner. A most enjoyable afternoon! The events ended with the usual thankyous and indeed the usual question over the continuation of the festival. It certainly deserves to continue. I relaxed afterwards by attending the final showing of the animated feature Gulliver's Travels (1939) in the cinemobile. Great! Some pictures later maybe. I was too busy to take any!! Lots going on today in Trim. The one-day reading of the whole of Swift's Tale of a Tub took place in Market Street with readers having a choice of reading in the tub with shoes on, with shoes off or ignoring the tub. Above a good friend of the festival, UCD Professor Andrew Carpenter, one of the early readers. I read my two pages, contributed to the Aware charity and got my certificate. A good crowd attended my talk on Gulliver as Comic Book Hero. They listened attemtively, laughed at the correct moments and some came up to me to discuss comics afterwards. I enjoyed it! Tomorrow, the last day of the festival, sees the final of the 5 minute drama and the Battle of the Books as part of the Bite of Satire: Lunch and Extras event. Tickets have been selling well for this I hear. 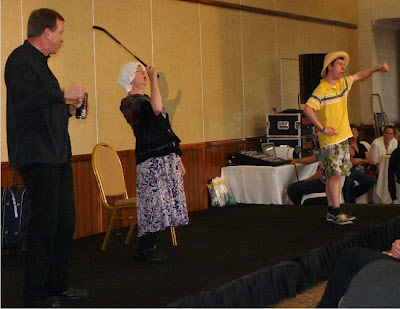 We have rehearsed my play and my actors will do their best as will the Boyne Writers Group in the satire competition. No sign of the Meath Writers Circle around the town today - they must be training in secret somewhere. Good luck lads!! The weather may have been bad but the show must go on! Boyne Writers Group and members of the passing public read poetry in the main street of Trim yesterday as part of the Swift Satire Festival. Paddy Smith, (above) Swift committee member and chair of the writers group, started proceedings. I thought his choice of The Donkey as first poem of the day a bit self-satiric but Shall I compare thee to a Summer's Day as second was inspired. This summer's day would have been at home in February or November. Today I give a talk on Gulliver as a Comic Book Hero at 5pm in St Patrick's Cathedral, Trim where a wonderful exhibition, Swift in 30 Objects, is on show. And in the satire tent, satire and comedy all day (and part of the night). The official launch of the Swift Satire Festival last evening in Trim Castle Hotel. Noel Dempsey, former TD and government minister, whose idea the festival originally was, speaking. Behind him the chairpersons of Meath County Council and of Trim Town Council. So how would Swift have reacted to Facebook and Twitter. would he have been blogging? Read some of Swift's words in water taken from Swift's Laracor and help Aware! What genuis comes up with these brilliant ideas? If it rains will the whole thing get diluted? 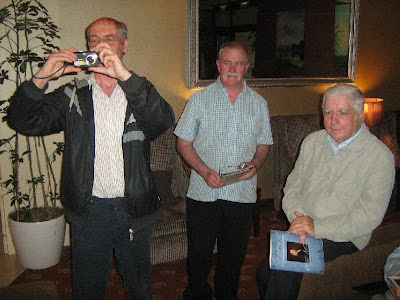 The three members of the Meath Writers Circle looking very pleased with themselves. Just because the rehearsal went well doesn't mean the Battle of the Books is in the bag Tommy!! 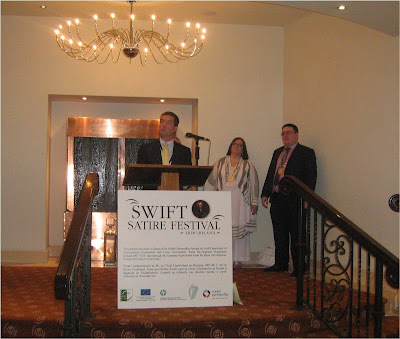 OK it's about to start - the Swift Satire Festival (the new official name) is being launched this evening at Trim Castle Hotel at 7.30. And then until Sunday evening a feast of events to suit everybody's taste. One of the strengths (though it might actually be a weakness) of the festival is the wide range of different events. You need to check the website to see the full list. This year a new feature is the Cinemobile, the mobile cinema, which will show the 1939 feature length cartoon version of Gulliver's Travels but also present day films like Snow White and the Huntsman. A nice juxtaposition is the successive showing of The Dictator (Sasha Baron Cohen) and The Great Dictator (Charlie Chaplain). There's a satire day all day Saturday in the comedy tent with many of Ireland's top comics performing and the usual Swift Round Table dinner and discussion on the Friday evening featuring many of those well-known commentators who pretend to know something about everything (a common Irish failing). 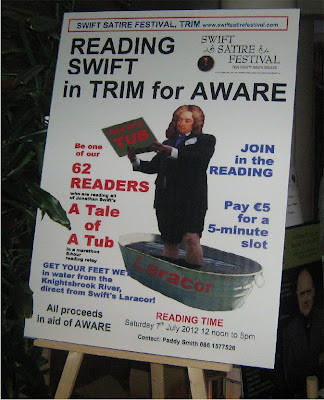 There's also a public day-long reading of Swift's Tale of a Tub and poetry reading in the streets of Trim. Just come along and join in. I'm giving a public talk on Gulliver as a comic book hero in St Patrick's Cathedral, Loman St. at 5pm on Saturday. The cathedral is also hosting an exhibition of items associated with Jonathan Swift curated by William Dalton, a native of Trim who is now living in Dublin. It includes the altar silver Swift used at Laracor, Trim’s 18th century maces, historic editions of Gulliver’s Travels and much more. Opening hours 3-6pm on Friday and Saturday, 6th and 7th July, and at the end of the Guided Walk (11am start of walk) on Sunday, 8th July. And then on Sunday the Bite of Satire - Sunday Lunch with the Battle of the Books and the final of the 5-minute drama competition. I'll be involved in both of those. And also on Sunday as part of the Bite Of Satire: Sunday lunch + extras is the annual Battle of the Books. This is the third year of this satirical writing and delivering competition between our Boyne Writers Group and the Meath Writers Circle. We won the first one, they the second and we won last year. The opposition more or less self-destructed last year with their timing completely off. There is a strict time limit with transgressions punished by loss of marks. Their satire was very good but some pieces were far too long and they lost lots of marks. I'm sure they will have everything finely tuned this year and I expect them to win easily. Ah well! We are finalizing our team on Thursday night. Teams have been reduced from four to three this year so we may have to have a vote to select our three. The photo above, showing the rival captains Tommy Murray and myself, was staged as publicity for the original contest and has been reused in this year's brochure. Tommy has been giving little away on his blog. The Battle of the Books is part of Sunday's A Bite Of Satire: Sunday lunch + extras. For €20 you get a 2-course Sunday lunch PLUS the annual Battle of the Books PLUS the Five Fives drama competition for five 5-minute plays PLUS a chance to see the specially restored version of the 1939 full-length animated film, Gulliver’s Travels, which will be given a private showing in the Cinemobile immediately after the lunch event. Not to be missed - book your tickets online! Next week-end sees the Trim Swift Festival or the Swift Satire Festival or whatever it's called this year. Changing the name appears to be a clever touch of Swiftian satire. 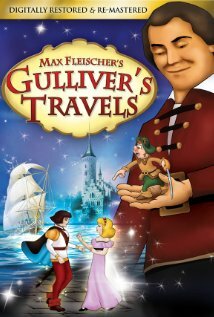 After all Gulliver's Travels isn't called Gulliver's Travels, if you know what I mean. Anyway I entered their new five minute play competition, Five Fives: the flash drama competition, and got shortlisted. The five shortlisted plays have to be performed as part of the Bite of Satire event on Sunday afternoon in the Trim Castle Hotel. Inspector Gulliver Calls, by Vera Cait Walsh, Wicklow Town. 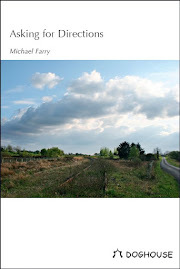 Gulliver’s Travels: A modern 5-minute version, by Michael Farry, Trim. The plays had to have no more than 3 characters, one of whom had to be called Gulliver. It does appear that each one included a Swift reference instead of just having a random Gulliver character. Actually my three characters are called Gulliver though this probably won't get me any more marks. I have been lucky to get three prominent members of Trim Drama Group to take the parts in my play and rehearsals have begun. I'm supposed to be the director as well as writer but these experts need little direction. It should be interesting to see how the writers have approached the task. Five minutes is a bit brief to develop characters so mine is designed as a bit of a romp and designed to get a few laughs. The event, which starts at 1.30 on Sunday 8 July also includes a lunch and the annual Battle Of The Books, "a verbal joust of satirical writing between the Boyne Writers’ Group (the holders of the trophy) and the Meath Writers’ Circle". I'll probably be involved in that as well though we still have to finalize our team. You can book on the Festival website.